The Association of Law List Publishers (ALLP), established in 1935, is an organization of the publishers of reference directories which contain names of lawyers handling commercial and consumer debt recovery, bankruptcy and creditors’ rights law matters. The members of the Association continually work to promote the Commercial Law League of America, the triadic system and to enhance the creditors’ rights practices of their listees. The membership of the ALLP subscribes to the high standards of professionalism, and all members actively promote the services of the lawyers they list. All members are governed by the Association of Law List Publishers Code of Conduct. Each ALLP member provides a bond of indemnity against acts of larceny, embezzlement, or fraudulent failure to remit covering only the attorneys (not their employees) listed in their directory. There is no coverage offered for malpractice, including errors and omissions. The bond is extended to those who qualify to receive a directory and who notify the attorney which law list is being used, as well as submit a forwarding notice (within 35 days of employment) to the appropriate list involved. No single employment may be registered with more then one law list. Each list maintains an active customer service department and provides customer service to all who register items with their list. Because of the bonding coverage and service provided by each list, the attorneys listed in member directories must complete an application and the lists verify the applicant is a member in good standing of their respective state bar association (s). All of the attorneys listed have indicated the desire to receive collection items. 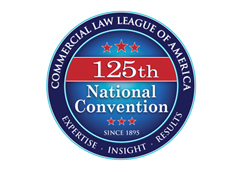 In addition, the publishers have confirmed that their listed attorneys are cognizant of industry standards relating to reporting requirements, contingent fee arrangements, and that the listee subscribes to the Operative Guides for Forwarders and Receivers as adopted by the Commercial Law League of America. The list of Publishers can be seen below. Please contact them for further information or to receive free copies of their directories for use when referring collection matters. When forwarding an account to an attorney, use an Association member’s service. In order to be protected by a bond, you must properly forward the claim over to one of the member’s directory by notifying both the attorney and the list on each and every referral you make. Thank you for your support of the ALLP.